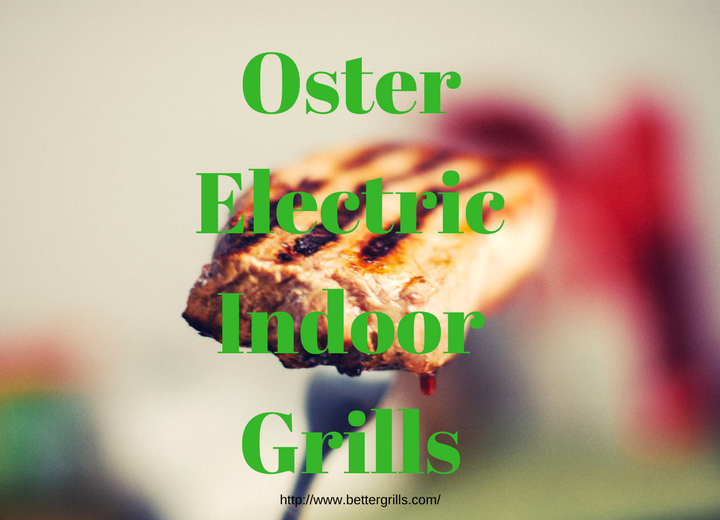 An Oster grill is on the indoor electric grill wish list of many people and reason is the affordable price on combination with the performance. When I start looking at Oster indoor grills to see if they were worth writing reviews I was surprised by the positive reviews and wonder why this brand is not more popular than it is now. The used on stick surface is made of PTFE free materials. This Oster 7 minute grill grill comes in three colors. Red, Black and white and red to match your kitchen decor. The DuraCeramic coating in combination with the digital timer makes this grill very easy to use. The claim is that this grill cooks virtually everything in 7 minutes. This is 20% faster than an ordinary grill and will also safe energy by doing it that fast. The drip tray can be removed for easy cleaning. the grill will lock into place so that the juices will drain very effectively. You can simply click on the picture to check the low price we found or wait on our full review we will do later. This indoor grill comes in two colors and thus models. the Oster CKSTPM20W-ECO and the Oster CKSTPM20WM-ECO. One color is black and the other I wouild describe as beige. The durable non stick cooking service of this Oster duraceramic makes it very lasting and easy to clean. The grill comes with adjustable feet that will let the juices run into the drip cups very easy. There are two easy to remove drip cups that will catch the fat and other liquids. The cooking features of this grill will make it easy to cook healthy food with less fat. The grill can also be used flat for grilling and than you can use both sides. Very easy for breakfast cooking. You can click on the picture to see the price or wait for our full review that we are working on. The floating hinges are a very nice feature of this grill and panini maker. This makes the grill adjust himself to the thickness of the sandwich or meat you are cooking on it. This is an extra large indoor grill with its 13 x 15 inch surface and this makes it easy to grill two sandwiches at the same time or two pieces of meat. The griddle plates are not removable but are very easy to clean with a damp cloth. This easy cleaning is possible because of the ceramic coating. A ceramic coating is my personal favorite for most grills. There is no on/off switch and you have to unplug it to turn it of. You can click on or under the picture to see the price or wait on our full review we are working on. The model number of this DuraCeramic Oster is the CKSTGR3007 for if you like to look it up. This is a reversible grill with a non stick PTFO free grill surface. The two side are a grill or a griddle and this makes this a very versatile grill that you can use for grilling meat and pancakes, eggs or bacon in the morning. The handles stay very cool and this is a big plus in my opinion. The cooking plate can be easily removed for easy cleaning. You can clean it by hand or in the dishwasher if you like because the plate is dishwasher safe. You can find the low price by clicking on the picture or just under or wait on the full review we are working on. This is an other indoor grill that can be used in two ways. First one is a panini maker and with the floating hinges this is very easy and the second one it the grill option. By opening the grill you double the grill surface and turn it into a large indoor electric grill. Many people like the floating hinges and the fact that it adjust to the thickness of your sandwich or meat very well. The grill option turns this product in a very versatile indoor grill for on the counter top. Although the plates are not removable they are very easy to clean with a damp cloth. The drip pan can be removed for easy emptying and cleaning. The non stick surface is ceramic and does not contain any PTFE that we all know can be dangerous for our health. You can click on the picture to find the very affordable price or come back later and read the full review that is in the making. Any indoor grill should be used what it is made for and not for any other purpose. For safety it is highly recommended not to leave the grill unattended and or leave the room where you use it. Keep an eye on the cord that it can not be grabbed by children to keep them safe. The fire brigades always recommend to have a fire extinguisher in any kitchen and we also recommend that. If you are looking for a different brand than the Oster indoor grills we reviewed here you can have a look at all the indoor grills we reviewed by clicking in the link. We have seen that people look for an Oster indoor grill 4774 but have not been able to find it yet. Anyone can help me find it?